Last time I wrote about the pioneering work of Weston Price, DDS. Back in the 1930’s Doctor Price conducted extensively documented studies of traditional peoples on 6 continents and found that those still eating their indigenous diets enjoyed robust good health and remarkable immunity from tooth decay. He documented his findings in a landmark book: Nutrition and Physical Degeneration. Price’s findings still resonate today because they provide important insights into common features healthy diets seem to share. One feature I noted last time was the absence of processed foods, and particularly refined carbohydrates. So right off the bat, we know what these people were not eating. What they were eating varied considerably. 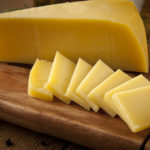 Swiss mountain villagers ate primarily whole grain rye bread, and raw cultured dairy products from pasture-raised cows, especially butter and cheese. Gaelic fisher people ate no dairy products. Instead they depended on fish, shellfish and oats. Eskimos ate mostly animal products, primarily fish and marine mammals. South Sea islanders consumed a wide variety of sea foods as well as many plant foods including coconut and fruits. Hunter-gatherers of Canada, the Amazon and Australia consumed a variety of game animals, especially the organ meats, as well as grains, legumes, tubers, vegetables and fruits when available. African cattle keeping tribes like the Masai consumed beef, raw milk and organ meats, while the Dinkas of Sudan, whom Price claimed were the healthiest of all the African tribes he studied, ate a combination of fermented whole grains with fish, small amounts of red meat, insects and their larvae, vegetables and fruit. 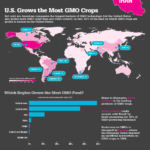 All of these diets were different, and relied on foods that were available locally. Yet when you examine them closely, they share common features. One is that they are all rich in fat, especially animal fat. Dr. Price chemically analyzed the foods consumed by healthy peoples and found that they contained 10 times more fat soluble vitamins than Western diets at that time! This point should be especially salient today when deficiencies in some fat soluble vitamins like Vitamin D seem to have reached epidemic proportions. Second, healthy native people ate whole foods. When they ate grains, they ate whole grains. When they relied on dairy products, it was raw whole milk products including the butterfat. When they ate game animals or fish, they utilized the whole animal and particularly valued the organ meats, which most modern Westerners eschew. Third, many foods were eaten either raw or in a fermented state, making traditional diets rich in enzymes. Enzymes are catalysts that are important in many chemical reactions in the body. 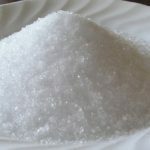 One important thing they do is assist in the digestion of cooked foods. Fermentation was a necessity for traditional peoples who, lacking refrigeration to keep food from spoiling, relied on fermentation as a method of preserving foods including dairy products, fish and meat, vegetables, and cooked grains. While few of us depend on fermentation to preserve our foods today, some of the healthiest foods we eat are naturally fermented. One of them is sauerkraut. 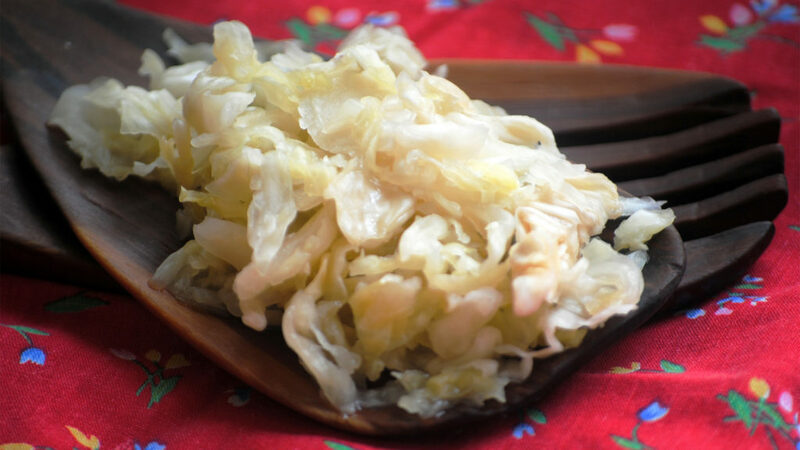 The original sauerkraut dates back to China 6,000 years ago. In ancient Rome, it was used for digestive problems. Tiberius carried sauerkraut on his voyages to the Middle East because he knew that it protected his men from intestinal infections. Sauerkraut is easy to make. Here is a simple recipe from Sally Fallon, author of Nourishing Traditions. In a bowl, mix cabbage with caraway seeds, salt and whey. Pound with a wooden pounder or a meat hammer for about 10 minutes to release the juices. Place in a quart-sized, wide-mouth mason jar and press down firmly until juices come to the top of the cabbage. The top of the cabbage should be at least 1 inch below the top of the jar. Cover tightly and keep at room temperature for about 3 days before transferring to cold storage. 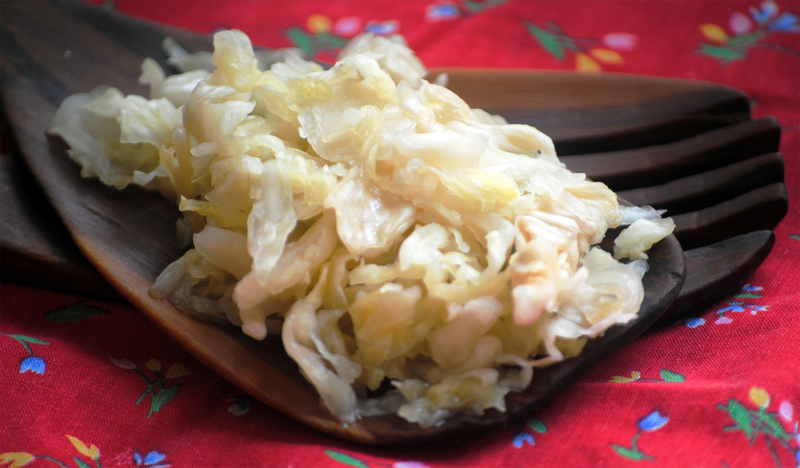 The sauerkraut may be eaten immediately, but improves with age.